Being New Year's Eve and my 365th post for 2011 I thought I would pull something out of the top draw. I found this wonderful record at the non-library music blog Franklin Mint late last year and have been sitting on it ever since in the knowledge that many of you would be blown away. To be honest I don't think the guy who runs FM quite realised just how desirable this music would be to library fanatics like us ( he could probably sell it for, well, a mint ). 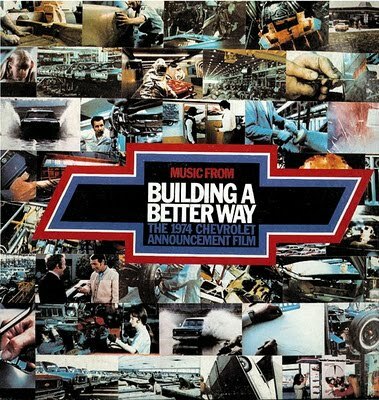 The album is a collection of music that featured in the promotional film "Building A Better Way" which was used to launch the 1974 Chevy product line. Having long since fallen in love with "Ford Taunus" by Christian Bruhn ( see "Popshopping Vol.1" ) I was well aware of just how funky auto related library music could get and these 14 tracks do not disappoint. Having said that, there is a heavy dose of orchestral easy listening and even a few electronic touches here and there but when things get funky they get SERIOUSLY funky! "Designing" and "Building" are mind boggling in their cinematic lushness with wah wah and blasting horns that rival anything that blaxploitation has thrown up. "Corvette" is a more straight ahead 60 seconds of blissful, pure funk while "Proving" evokes images of a high performance Chevy blasting around the race track. On the easy side of things, "Impala" sounds like an off cut from "The Sound Gallery Vol.2", "Vega" and "Nova" both have irresistible pop charms and "Caprice" speaks for itself. The collection is wrapped up with a wonderfully corny vocal number espousing the qualities of Chevrolet. I have no idea who composed this music but they certainly knew what they were doing, every note is purposeful and self assured. As you can tell, I absolutely love this record and I have no doubt you will too. 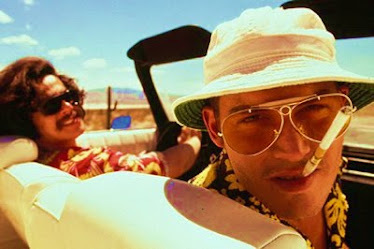 It's been a fun and funky year, play safe tonight and I hope to see you all on the other side. Cheers! Good stuff, Mr. Craig. Excellent good stuff. My dad worked fo a pretty large insurance agency in the sixties and early seventies and handled business with local car dealers, and while I don't remember this LP in particular, he always seemed to come home with stuff like this for he and Mom to listen to. I scored an occasional scale model of a new or upcoming model, especially Fords. So...many thanks for all you've shared this year, and this one in particular. Happy funky new year wishes to you! Whoa!!! Awesome album, wouldn't be surprised if these were well known musicians making a quick buck doing production soundtrack work. If you say it's funky, that's good enough for me. Thanks for 365 awesome posts, and looking forward to many more to come....keep up the good work! A top-notch way to end the year, Mr.C! I enjoyed the audiophonic wonders you unearthed for us all in 2011, and am looking forward to more of your GREAT work in 2012. May all your frolics be funky! Nice one, thanks for this! A jillion thanks for the re-up, Mr. C! Looks awesome. Sadly the link is not working now. If you can reupload this one I would love to give it a listen! Thank you so much for this! What a gem! Who would have heard of this stuff if it weren't for music blogs like this one.